DISCLAIMER: You must use a lamp designed for housing a PAR38 Bulb to ensure it functions correctly and doesn't cause a fire. Your warranty with ABI will be void if your bulb burns out because it was used improperly. I nor ABI will be responsible if your house burns down due to your improper usage of the bulb. 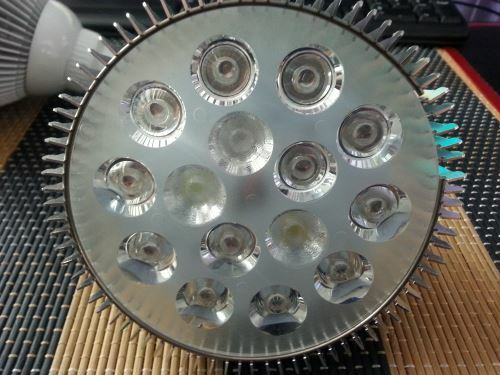 What you see in the image above is NOT the correct housing for A PAR38 Bulb). One of the problems with reef lighting is that it can be very expensive. Luckily, pico reefs are relatively small and a single par38 bulb can provide all of your corals lighting requirements. These bulbs are inexpensive, don’t require a lot of power, and can be found easily online. In fact, these are some of the reasons I got back in to reefing from my apartment. 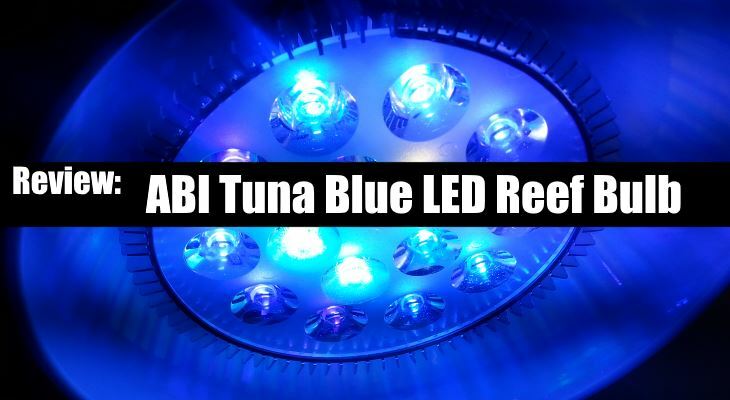 Today I want to introduce you to the ABI Tuna Blue reef bulb. On recommendation from Maritza The Vase Ree﻿﻿﻿﻿f (Pico Reefers), I jumped on ordering this bulb as fast as I could. Why? Let’s dive right in! The Tuna Blue blub comes in 2 wattage's. 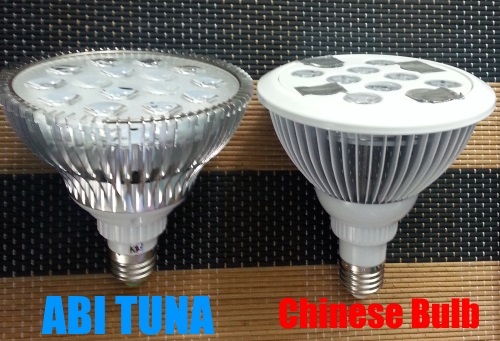 You can choose a 12w or 24w bulb, although there is a price difference (which is still way cheaper than buying a traditional setup). 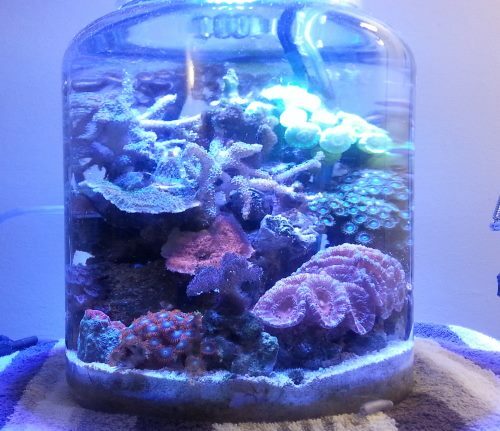 Since this was just to light my 2 gallon jar reef, the PAR38 12w bulb was more than enough. I love the fact that we have now an option for a full colour spectrum PAR38 bulb that doesn’t break the bank. The bulb stays relatively cool because it uses LEDs. I have no need to use a fan to keep it cool. The ABI Tuna Blue is not quite as blue as I’d like, but then again... I really love a 20K look. This is kind of a moot point when it comes to the health of your corals. The bulb still gives you a great reef look and highlights corals. I’ve previously used an ABI blue reef bulb (6blue:6whites) and thought it was a good light too, but it was little too white for my preferences. I ended putting duct tape over some of the whites to give a deeper blue look and reduce the intensity of the light in to my jar. Note: I don’t recommend covering lights with duct tape as this is a potential fire hazard. If you already have a bulb shining down on your corals and are considering buying the Tuna Blue, I recommend hanging this light much higher than your current one. Not only is the light intense, new bulbs should always start off higher during their “break in” period and for your corals to adjust to the new spectrum. If this is for a new setup, I would recommend hanging it 15" - 20" above a 2 gallon cookie jar and adjusting as needed. Lighting can be tricky to get right and if you get it wrong it can have devastating effects. I think this is a great bulb for anyone looking to light up their small reef. It gives you the option to grow most types of corals, but most importantly leads to better coral health.